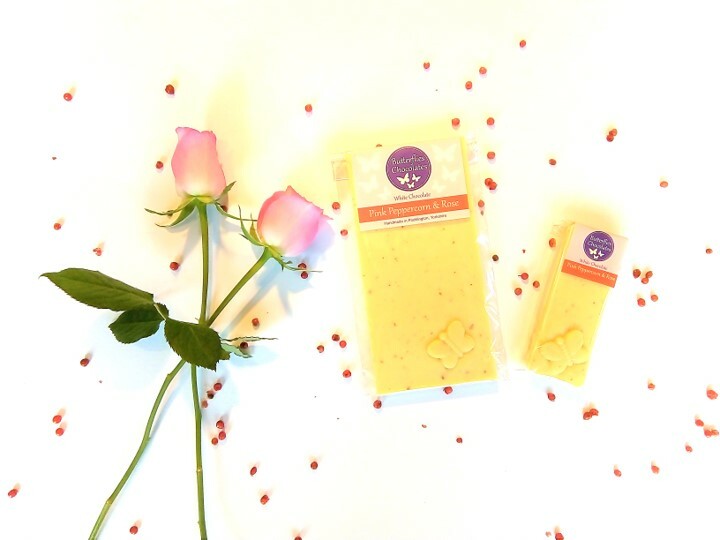 A bar of our creamy white chocolate combined with organic rose oil and gently spiced with crushed pink peppercorns. A beautiful indulgence with a fragrant finish. Also available as a small butterfly bar. White chocolate (sugar, cocoa butter, whole milk powder, emulsifier: soya lecithin, natural vanilla flavouring), ground pink peppercorns (0.2%), organic rose oil (sunflower oil, rose otto oil) (0.1%). White chocolate contains 28% cocoa solids minimum, 23% milk solids minimum.